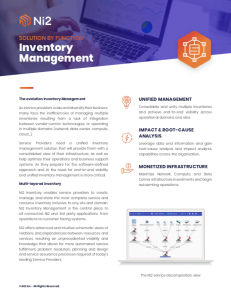 As service providers scale and diversify their business, many face the inefficiencies of managing multiple inventories resulting from a lack of integration between vendor-centric technologies, or operating in multiple domains (network, data center, compute, cloud…). Please fill in the information to download you document. With demand for high speed connectivity, Network Operators are building new capacity and expanding operations with mergers and acquisitions. 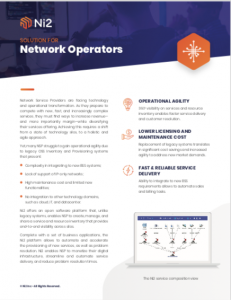 As a result, many operators are managing fragmented networks, systems, and multiple network inventories with difficult and inefficient data sharing. 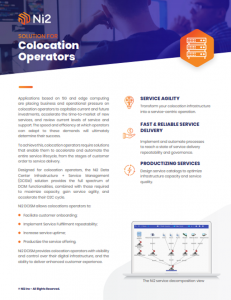 From edge computing capabilities to network services, colocation operators need a solution to manage the full extent of their infrastructure, as well as provide them with a clear visibility on each of their customer’s environment. MTDC need a solution to support them in extending the useful life of their data center by optimizing the use of existing capacity. 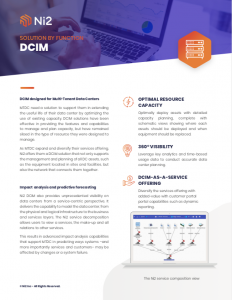 DCIM solutions have been effective in providing the features and capabilities to manage and plan capacity, but have remained siloed in the type of resource they were designed to manage. Accelerate time-to-market of new generation services with agile and automated fulfillment capabilities. Ni2 delivers insightful service decomposition, complete with schematic views, resulting in unprecedented visibility on all network, data center and digital services—their data, attributes and their dependencies— allowing for more efficient service fulfillment and service assurance processes required of today’s leading service providers. MTDC need a software solution that provides them with agility and efficiency for optimal response to their customers. Service Management is no longer only about resolving incidents or managing assets, it’s about running the entire service operations in complete synchronicity while sharing information across teams and units for smarter and faster decision making. As Network services become increasingly more complex, customers expect more in terms of speed, performance and reliability. Network operators should rely on a Trouble Ticketing solution that provides them with agility and efficiency required for optimal response time and meeting the most demanding SLA. Network Operators are the foundation of the Digital Transformation. Yet, as they scale operations to meet the growing demand for high-speed broadband and new technologies, their incremental costs are impacting their margins. Human-processed service delivery is no longer viable option, either from customer value, nor revenue.